Melbourne has the second highest number of Greek people in one city anywhere in the world, only behind Athens. As such this was never going to be one of the harder countries to find beers for. 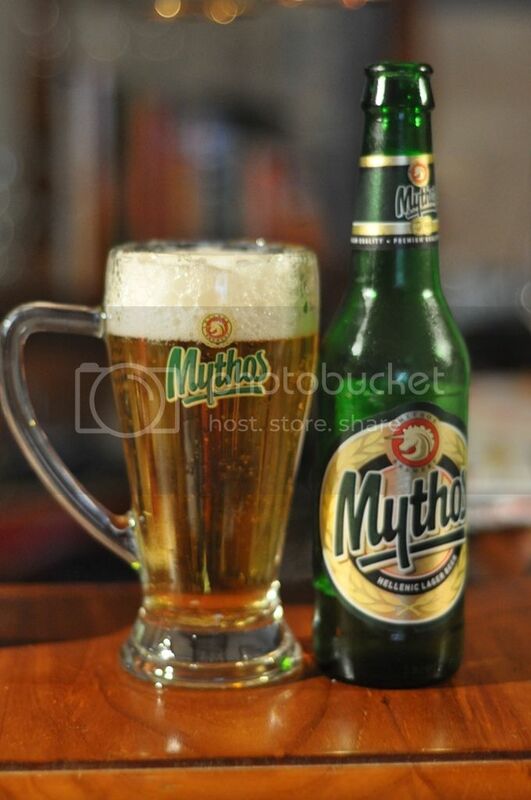 I was actually going to have the Athens Craft Lager but then I found these excellent Mythos mugs and it swung my thinking. Hopefully this is just a nice nomal lager. I'm not after anything fancy this evening and as long as this is refreshing I will enjoy it. Euro Pale Lagers are the world's most common style of beer, you should all know at least 10, Heineken and Carlsberg are both well known examples. Well let's get into this! The pour is a very light straw colour. It has an excellent large white head, which is quite aerated. There appear to be significant bubbles throughout the beer still rising to the head. The head hangs around for quite along time and subsides to a small ring around the glass. This in turn laces the glass very well, it's a good looking Euro Pale Lager. It's looking incredibly inviting! On this nose this beer isn't anywhere near as appealling, unfortunately! I can barely make out some light grains and grassy notes over a smell which isn't quite skunkiness but is something similar. There is lots of corn and a strange bitter smell. There is some minor citrus hops on the end of the nose, not enough though. It's actually quite interesting but not really appealling, I hope it tastes fantastic as I really need a nice cold beer! It's actually everything I want! It's wet, it's cold and it has an excellent bitter balance to the beer. In no way is this beer complex in flavours, it has mild citrus and grass notes but nothing exceptional. There is definitely a strong corn taste, not my favourite adjunct but in this beer it isn't that bad. The carbonation is moderate and the finish is nice and dry. It's a serviceable beer, you could drink heaps of these! Fantastic session beer! Again don't take this to mean, that this is a fantastic complex lager, it's not! But if you are after a beer to drink 10 of this is your beer. It is not offensive in anyway, there are no noticeable hops in this beer, no good malts and really it's nothing more than watery vegemite! I'm far too tired to have written this review, so if this doesn't make sense I apologise. Anyway this beer would be perfect with greasy fish and chips and, I would assume, greek food. Get some for Summer!